"Kveik" - what does it mean? I've been writing about kveik for about four years now, and that word, which seemed so crystal clear to begin with, is now beginning to confuse people. So, let's see if we can set things straight. That's not easy with a word that's already in active use around the globe, but let's at least try. Let's start with what it does not mean. Kveik is not a style of beer. It means "yeast" or "traditional farmhouse yeast," but definitely not a kind of beer. If you want to say "Norwegian farmhouse ale," without referencing any particular style, then say maltøl. But beware that that's a bit like saying "English beer." There are several very different styles. When I went looking for kveik in western Norway in 2013 I met Sigmund, and he called his yeast "kveik." So I did the same. A few days later I visited Stein Langlo and his friends in Stranda, and they gave me kveik and answered my questions, without ever making it clear that they didn't call the yeast kveik. In Stranda the word for yeast was "gjær." So for years I went around talking and writing about kveik, thinking that's what people in western Norway called their yeast. It wasn't until this spring that I went through my material systematically plotting the dialect words people used for their beer yeast in various places. What I found was not at all what I expected to find. See the map below. The most common word for yeast in Norway seems to have been pronounced basically "yest" or "yester", and is clearly the same word as English "yeast." Kveik has been common in western and southern Norway, but it was not the only word used. Most of the people in western Norway who have farmhouse yeast today seem to call it kveik. Those few who have yeast in eastern Norway call it "gong". The original meaning of the word was simply "yeast," because there used to be just a single kind of yeast. That was the one you used in beer, and if you managed to get hold of some wheat you'd use it for baking, too. But then yeast became available in the shops. Now the brewers distinguish between "gjær" (the standard Norwegian word for yeast), which is something you buy in the shop, and "kveik", which is the traditional farmhouse ale yeast. I started using "kveik" to mean all kinds of traditional farmhouse yeast that has never been purified into a single strain, basically because I felt a word for that was needed. Writing about Lithuanian beer without having a word for this type of yeast was really awkward. Some Lithuanians seem to call it "family yeast," which kind of works. On Gotland people seem to have called their traditional yeast "hemjäst" (home yeast), which also kind of works. However, now Richard Preiss's research shows that the Norwegian farmhouse yeasts seem to form a separate group of yeasts. They seem to share some flavours, ferment fast and hot, they can be dried, they're non-phenolic, and they're genetically similar. The Lithuanian ones seem to be similar, but can't be dried and are phenolic, and they're not related to the Norwegian ones. That's awkward, because now it seems we need a word for Norwegian farmhouse yeast, and another for farmhouse yeast generally. Farmhouse yeasts, all over Europe, seem to have been fast fermenters that worked at very high temperatures. So they really do have something in common that sets them apart from the ordinary commercial yeasts. Richard has proposed using the term "landrace yeasts" for yeast cultures that have not been purified, in analogy with landrace grain and hop varieties. These are the varieties people grew before systematic breeding of grain began, and they consisted of lots of genetically different grain varieties (in the same field) adapted to the place they were grown in. That analogy works, even if the adaptation to a specific place is kind of loose in yeast. To make things even more complicated, it turns out that some commercial breweries are still, to this day, using yeast that's not purified. So that means we have three concepts: yeast that's not purified to a single strain, farmhouse yeast, and the Norwegian farmhouse yeasts that are all related to each other. I'm tempted to use "kveik" to mean "Norwegian farmhouse yeast." Jørund Geving points out that if we manage to revive yeasts from central Norway we'll then start calling them "kveik" even though the locals call it "gjester." And the yeasts from Ål in Hallingdal, which the locals call "gong" will then be called kveik by everyone else. That's not ideal, but realistically I think introducing that many words is going to be difficult, unless some of these yeasts really are totally different from the others. Which they could be. We don't know yet. So, that's my conclusion. I'm going to use "kveik" to mean "Norwegian farmhouse yeast" from now on, and probably "farmhouse yeast" for farmhouse yeast in general. Whether "landrace yeast" catches on I guess we'll see. Note, though, that kveik is not a single strain of yeast. Each of the cultures contains many strains, and the various kveiks are quite different from one another. The ones from Voss make orange flavour, while the classic Hornindal kveik makes a fruit and milky caramel flavour, while Ebbegarden makes a mango or pineapple-like aroma. To see how many there are, check the registry. kveik, male, reawakening, new strength, also used for fresh growth in the forest, or sprouting to new life. The male/female difference is because like most western European languages (German, Spanish etc) Norwegian has gendered nouns. So "kveika" (the kveik) would be yeast, but "kveiken" (the kveik) would be reawakening/fresh sprouts. The two meanings are different nouns with different genders. You don't need to be a genius to figure out that the first form here comes from the second, because putting yeast in something really kind of does bring it to life. Indeed, if we look up "kveika" in an Old Norse dictionary we find it has both meanings. "Kvikr" seems to be an adjective basically meaning "alive". And as Martyn Cornell observed, it's obviously related to the English "quick". Which an English etymological dictionary quickly confirms. If you search the web, or the Norwegian national library, for "kveik" you find lots of examples where it's used in the meaning of putting new life into something. Putting fresh zest into the teetotalling work was a common usage in the early 20th century, for example. Just as a matter of interest in the North West of England there is a bread called Barm Cake - it was traditionally made with the barm yeast from the froth (barm) of an top fermenting english ale. I wonder if the name comes from the Vikings? 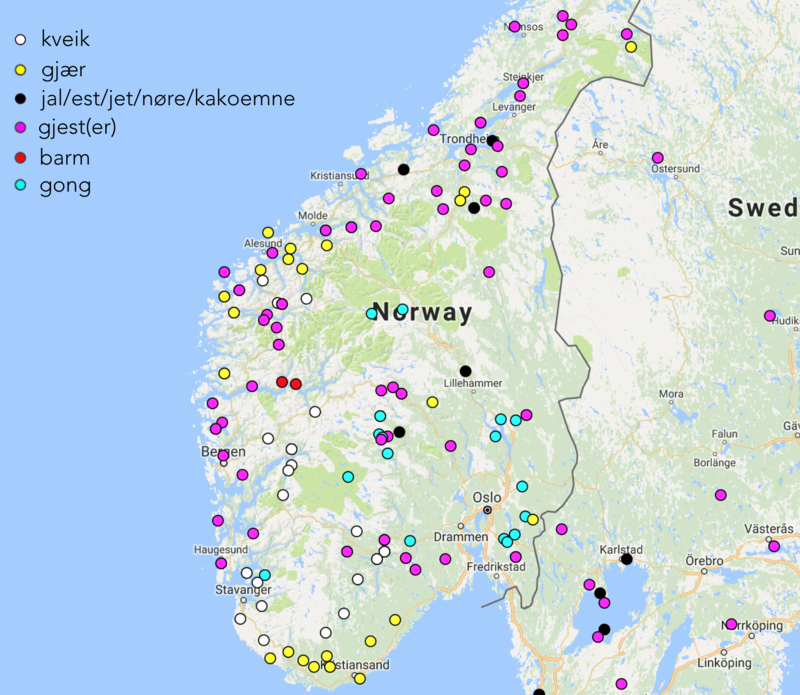 @Tom: I don't know where the word "barm" comes from, but you can see from my map that the same word is used for yeast in Sogn. There were also other places in Norway where they used it to mean specifically the bottom yeast slurry. In Sussex, England the farmhouse brewers called their yeast "barm". So there has to be a common origin somewhere, but I don't know where. Re ethymology: In Sogn [the district around the Sognefjord], where I live, older people used to say "kveika i omnen" ("to lit the fire in the stove"). So we also have the verb "kveika" in addition to the nouns and possibly the adjective. @Svein: Yes, that's true. It's also in the dictionary, as "kveikja", but I left it out to not make this too long. Clearly, it's related and coming from the same root. It might even be the original root, actually. It's interesting (to me) that you reference a milky caramel flavour in reference to some of this peasant-style/artisanal/heirloom brew throughout your blog posts on Norway brewing (especially Hornidal). Since you give many references to how these styles of beer/ale are drunk exceptionally young at 2-3 weeks at best, 7-8 weeks at worst, then most of them will be loaded with metabolites of the yeast that are not present in properly matured beer. The obvious two in green beer are acetaldehyde and diacetyl/acetoin. The first, acetaldehyde, gives a very tart taste to beer that can be confused with acidity. Some say its like green apples or cider, while others say its more like solvent. The actual perception depends of the beer style, I think it gives a distinct orange-like tartness to pale homebrew, a bit like galaxy hops can do. Acetaldehyde is on the yeasts metabolic pathway to either ethanol or acetic acid. The second, diacetyl/acetoin, also gives varying aromas and tastes to different people. Most think it smells and tastes like butter, but a much more accurate description is that it resembles butter-scotch (an english sweet made from butter & brown sugar). Caramel, the sweet, is made from adding milk to brown/browned sugar. See where I'm going here. Diactetyl (and the overlooked, acetoin) give flavours to beer that taste very much like buttery-caramel-toffee. I think a lot of the unusual flavours that people are tasting in these types of beer drunk very young (Maltol, Sahti, Koduolu, Gottlandsdricke) are from the maturation cycle that they do not undergo, ie the lack of maturation. Remember, most beer in large local breweries of England/Germany in the 1700-1800's was drunk very well matured at 8-9 months. Drinking beer young is a very regional, peasant-thing to do. Interestingly, very recently I made some homebrew using probiotic tablets of Saccharomyces boulardii and the notes I made on the taste at bottling (not at drinking 12 weeks or more later) described the beer as very caramel-buttery like. I remember it now, they had an unusual butterscotch-caramel aroma and flavour to them. A year or 2 ago, you mentioned that Norwegian yeasts were phenotyped similar to S. boulardii (likes high temps, very tolerant of high acidity). I wonder if they still are. What do you call a single strain "kveik" that has been purified in a lab? It is not fully traditional, but brewer's yeast doesn't sound right either. I think "landrace yeast" is a good term for traditional yeast (both domestic and commercial) that has never seen a lab. @Mika: That's a very good question. I think the result is a single-strain kveik. It has all the characteristics of kveik, except it's just a single strain. It fits in the kveik part of the family tree, has high temperature and alcohol tolerance, makes kveik flavours, etc etc. Something that also could be of etymologigal interest is the phrase for "lighting a fire (in your stove)": "Kveikje opp (i ovnen)". This is a common phrase in western Norway, around Hornindal, Stryn and Nordfjordeid. Another example: "Ligthing a candle" (or even turning on a light switch): "Kveikje lys". It can be quite directly translated into "starting" something. To instigate or ignite something, or get the ball rolling, so to speak. To my way of thinking, with farmhouse (home) brewed beer, I think farmhouse yeast is quite appropriate (and accurate *enough*) for use. There is English yeast, American yeast, Belgian yeast, German yeast, French yeast and so on. All of them have many varieties, but are all a little similar in characteristics and are differentiated by their source. Such as Chimay yeast vs Westmalle yeast. Why not just call kveik "Norwegian" yeast and then differentiate them by origin? Hornindal yeast vs Voss yeast.